Jim was born and raised in Kansas City Moving to Minneapolis he attended Le Cordon Bleu Minneapolis- St. Paul. Upon graduation he moved to Chicago worked at Alinea practicing Gastronomic cooking techniques with an emphasis on using local products and ingredients. He continued his culinary advancement by working with Sodexho in the Corporate Division of downtown Chicago; serving many major clients including Sears Tower, LaSalle Bank, Federal Reserve Bank of Chicago, Shedd Aquarium, and Museum of Science and Industry. After working primarily in downtown Chicago, he became a Sous Chef at Mai Chef Cuisine Inc., a small off-site caterer focusing on high end dinners and receptions throughout greater Chicago. He came back to Missouri, becoming the Athletic Sous Chef at the University of Missouri- Columbia, where he was responsible for all football and basketball game-day buffets and private suite services then returning to Kansas City in 2010 and worked as the Sous Chef at The Nelson-Atkins Museum of Art. He assisted in the planning and execution of catered events and was responsible of the enhancement of the Friday Night Dinner in Rozzelle Court improving its popularity. 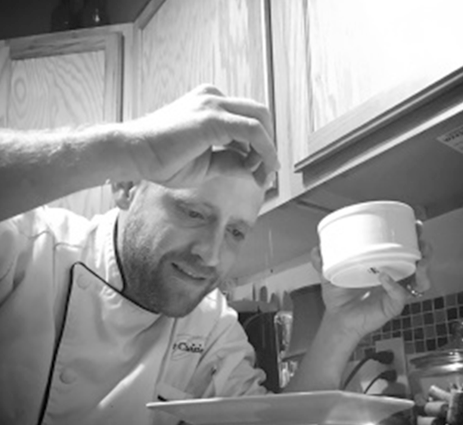 As an Executive Chef at the Stowers Institute for Medical Research, he became a great advocate of connecting fresh and local products to the great customers of Stowers. He has implemented and maintained an on sight Garden and continues to provide the most diverse meats and produce that is available throughout the year. Jim is happy to be here at In The Light where he loves to interact with the great people and pass on his passion for cooking. If not working or cooking, Jim loves spending time with family and friends, fly fishing, or watching any sports events especially Mizzou! Jim welcomes any questions and looks forward to giving the best flavors possible.